Monday's two challenges were successfully tackled: provisions were lugged round the dock in Gravelines whilst Bonify was still aground on the mud and then once there was enough water we cast off and have left France's oil refinery strikers behind us. There's plenty of fuel available in Belgium and as they are notoriously particular about 'white diesel not red diesel' it could be useful to have a bona fide Belgian receipt for white diesel. 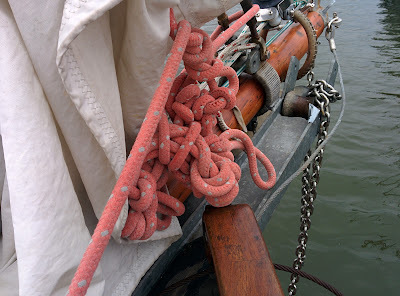 We left at 12.30 with 4 other traditional boats from “Escale a Gravelines”, sailed most of the way in a fresh breeze from the north west under grey skies and arrived Nieuwpoort 17.30, so 5 hours for 24 nautical miles. Our objective is to get to Ostend by Thursday to participate in Ostend at Anchor – a large public festival of traditional boats. We could have plugged on and got there if we'd needed to as it's only another 10 miles or so up the coast, and indeed our Belgian friends on their gaffer "Theodosia" did carry on, but we reckon we have plenty of time in hand and the tide was about to turn against us so we made for harbour. Not remembering whether we'd have room inside to turn and take the sails down we did it in the choppy waters off the harbour entrance which resulted in a strangely unhealthy looking muddle on the bow which it will be one of Tuesday's challenges to unravel. Not only does Nieuwpoort have more than its fair share of vowels, it also has an extraordinary number of yachts. It claims to be of the largest yacht harbours in Northern Europe. We came into the Royal YC on the west side which is big enough but the VVW marina on the east side has a staggering 2,400 berths. It was Monday so the club was closed but we dug out an eclectic mixture of odds and ends of fresh food and threw together a Boat Stew which our guest Keith, fresh off the ferry from Dover, was kind enough to compliment – but then we had plied him with red wine first. Joining in with the red wine were Roland and Rex who are also on their way to Ostend on Roland's wooden gaff ketch “Cleve Cloud”. It's a shame we didn't have enough Boat Stew for 5 as their supper had been blighted by a failed fridge. They had bought bags of ice but this had all melted, leaked and flooded the fridge (a good old-fashioned chest boat fridge) so their fresh food was warm and waterlogged. They had arrived at the supermarket here just minutes after it closed but had managed to buy baguettes somewhere along the way, so, after drinking wine on Bonify for courage and some jolly sailor's chat, they headed off down the pontoon to concoct baquette butties with whatever they could salvage.